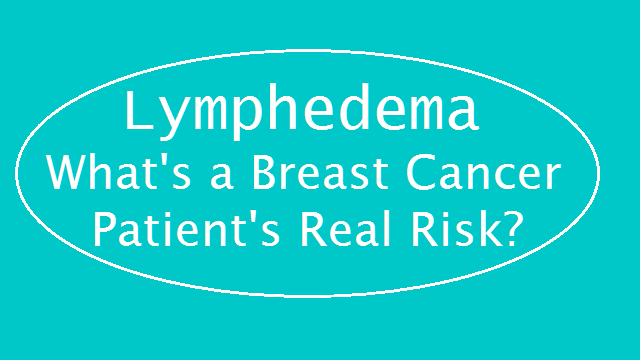 Lymphedema – What’s a Breast Cancer Patient’s Real Risk? March is Lymphedema Awareness Month and more and more people are becoming aware of this life-altering condition which affects up to 10 million Americans and hundreds of millions worldwide. Lymphedema is finally out of the closet. However, it’s also true that lymphedema is still often misunderstood and far too often under-discussed, or not addressed at all when a woman (or man) is diagnosed with breast cancer and facing treatment which might cause lymphedema or elevate her/his risk to develop it sometime down the road. It’s important to note that lymphedema can occur following treatment for other types of cancer, not just breast cancer. Any time the lymphatic system is impacted by the cancer itself or cancer treatment, there is risk. Therefore, lymphedema can impact lower extremities and other areas of the body as well. For obvious reasons, this post primarily focuses on risk for breast cancer patients. After your cancer diagnosis, the primary focus for you and those taking care of you is about addressing your cancer, as it should be. But this doesn’t mean the topic of lymphedema should be ignored either. Far too often it’s never even mentioned. I recall being told I should no longer have blood drawn from my “bad” arm, nor should I have blood pressure readings taken on that side. However, no one mentioned to me why this was, and I didn’t think to ask. Admittedly, before my cancer diagnosis, I had never heard of lymphedema, so how could I ask about something I knew nothing about? I learned about lymphedema at a support group meeting when a woman who had it shared about her experience. This particular woman had had a radical mastectomy 30+ years ago and her lymphedema developed about 18 years after that. Lymphedema more commonly occurs in the first three years following initial treatment, but obviously, can occur many years later. Do you want to read more articles like this one? Click Here. Lymphedema develops when the lymphatic system is unable to remove lymph, a clear fluid that circulates through the body removing waste, bacteria and other substances from body tissues. This impairment develops when the lymphatic system has been damaged by surgery (not necessarily involving cancer), radiation or other causes such as infection and fluid gets left behind accumulating in tissues, eventually causing damage and swelling. Sometimes there is a sensation of tightness, heaviness, numbness or pain. These symptoms can exist before swelling happens, as well as after. This is known as secondary lymphedema. When a person is born with a lymphatic system genetically predisposed to fail, this is known as primary lymphedema. This “failure” can present at birth or later on as well. Debate continues as to how much risk a breast cancer patient actually faces and whether or not risk reduction practices are even necessary. This only adds to the confusion surrounding lymphedema. As there is no gold standard for diagnosis, the criteria will vary and that adds to the confusion about how many people will develop it. Yes, lymphedema can be confusing, tricky to diagnosis and treat, unpredictable and once diagnosed, incurable. Once you have it, you learn how to manage it, but it won’t be cured, based on what we know today anyway. All the more reason to bring it up before, during and after cancer treatment, is it not? So what is the real risk for the “typical” breast cancer patient? Anyone who’s had surgery (or other treatment) affecting the lymphatic system faces risk of developing lymphedema. About 20 percent of breast cancer patients who undergo axillary lymph node dissection (ALND), a procedure in which 10-20 (or more) lymph nodes are removed from the armpit and tested for cancer, will develop lymphedema. It also shows up in about 5 percent of patients undergoing the less-invasive sentinel node biopsy (SLNB). But what’s the “typical” breast cancer patient’s real risk? There is no consistency in the data on the incidence and prevalence of lymphedema after breast cancer, probably because of differences in diagnosis, the different characteristics of the patients studied, and inadequate follow-up to capture delayed development of the disorder. The overall incidence of arm lymphedema can range from 8%-56% at 2 years post surgery. It’s hard to determine, which only adds to the confusion, right? More research is definitely needed regarding all things lymphedema related. 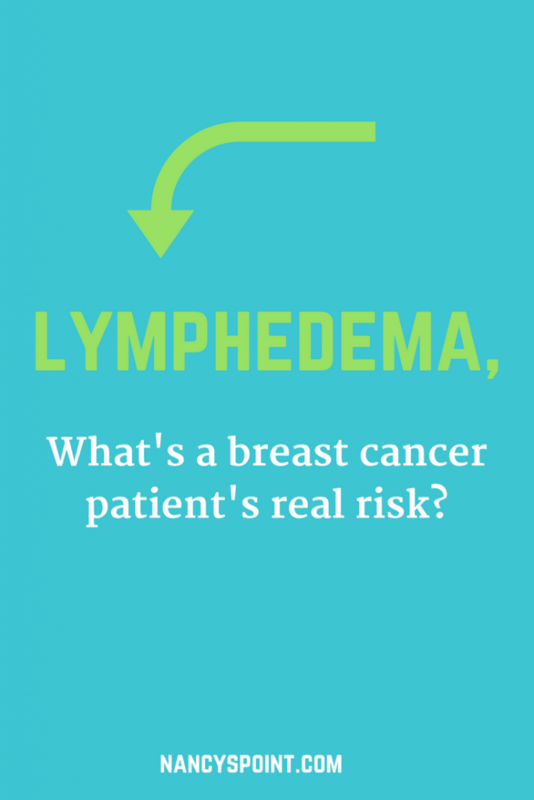 So what should a breast cancer patient do to better understand her/his lymphedema risk? 1. Get copies of your medical/surgical reports and and learn what they mean as best you can. Ask question until you’re satisfied with the answers. For example, it’s imperative to know if nodes were removed (and how many) during your surgery. 2. Ask your doctor(s) about your lymphedema risk. Don’t settle for the, don’t worry about it ’til it happens, answer. And yes, sometimes they still say this. Discuss what risk reducing measures seem reasonable for you to take. As always, eating a healthy diet, maintaining a healthy weight and committing to exercise (start slowly and get help if in doubt) are important things to try to do to reduce risk. 3. Learn the symptoms of lymphedema. Some of them ares: a heavy, tight, or tingling feeling in chest/arm/armpit area; swelling, numbness, pain, change in skin color or a general change in skin condition including rash, redness, itchiness, warmth; loss of flexibility in nearby joints or fever/flu-like symptoms. When in doubt, get checked out. 4. Educate yourself by visiting reputable sites. Good places to start are: Lymphatic Education & Research Network, Step Up, Speak Out; National Lymphedema Network, BreastCancer.Org and Lymph Notes. 5. Ask to have your limb measurements taken before treatments such as surgery or radiation begin. Having a baseline might come in handy down the road. This should be part of every breast cancer patient’s preliminary, before-treatment-gets-rolling exam IMO. It certainly can’t hurt to ask for this. Yes, lymphedema is scary and one more thing to worry about following a cancer diagnosis. But as always, becoming informed empowers you, enabling you to be your own best advocate when it comes to lymphedema too. After all, it’s your body. It’s your life. Was your LE risk discussed at diagnosis, or at any time for that matter? Did you have baseline limb measurements taken and recorded before treatment began? What’s your favorite LE resource? Sign up for weekly updates from Nancy’s Point. Another important consideration with lymphedema is with exercise…starting slowly and building up slowly is important for anyone at risk. If you’ve had radiation, any lymph node dissection or surgery that affects the lymphatic system- you are considered at risk. If you start exercising and have no issues, it’s okay to increase the effort or load incrementally. You always want to keep an eye on your body for a few days after increasing the workout. The most important thing is to do something! Being inactive is the worst thing you can do! If you work out with a trainer, make sure they understand about lymphedema, what it is, what can trigger it, and what to do if it is suspected. Alene, You’re right about exercise being so important regarding lymphedema risk reduction and management once diagnosed. Being inactive is rarely a good thing. Some confusion still certainly exists regarding how much a person should do or hard to push oneself. Many people could certainly use more guidance, which is one reason your new site is going to be so helpful for many. Nancy, Lymphedema was NEVER mentioned to me! I was told there was a danger in having blood presume readings taken, or a needle sticks in the right side of my body, but I was never told. I have been very careful to let my practitioners know about my mastectomy and to never use my right arm for treatmemt. You mentioned the symptoms of LE and I DO experience a “heavy” right arm, discoloration and pain. On the right side of my body (chest, right arm, weakness in my right leg creating a danger of losing my balance and falling. I have fallen many, many times. I also had a total hip replacement on the right side and don’t think it was mentioned at that time either. I have no idea when to raise a “red flag” and see someone about the symptoms or concerns of having contracted Lymphedema. Not one of the oncologists I have seen since surgery has ever mentioned Lymphedema, it’s dangers, symptoms. I was also never told, and it was never mentioned that I was eligible for reconstruction of the right breast. I would like talk to a plastic surgeon about the option. I have no idea how to go about starting this process. I also have never been given a single lab report on my surgery, the biopsy performed prior to mastectomy. I was told by the different doctors the number if lymph nodes that were affected. One was 3, one 13, the other 33. But I have not yet been shown or given a copy of these reports. When I requested them, they could not be found by any practitioner leaving me completely in the dark about this issue. I felt a bit cheated. I don’t know if there is a time frame where I am still eligible, it has been 9 years since diagnosis now. Am I still eligible for reconstruction? I am afraid of more surgery, but I am also terrified of being disfigured for the rest of my life too. Even though the prosthesis is adequate at this point, it is inconvenient, cumbersome, and I don’t feel “natural” at all. I feel cheated out if this opportunity to return to some what normal form. REALLY CHEATED. I feel slighted, and disrespected by not being informed of this procedure. Another important thing to mention is I have been diagnosed as totally disabled since 1991, due to a broken neck and I live on Social Security, only $982.00 per month, this is my total income which is insufficient for anyone to try to live on. The nursing home I was recommended to is medically paid for by Medicare and Medicaid, but yesterday I was a told this “skilled nursing facility consists of an apartment, and they informed me I would be required to pay $2,000 a month for rent. I was surprised by this expense and have no idea how to pay for it with my limited income. It us also an unfurnished apartment, and I would need extra a cash to pay for furniture. I am capable of living lean, I have done it for years, but now it seems my capability of going to this nursing home is out of my price range altogether. I have no other income, no savings, and no idea what to do at this point. I am totally confused now as to what to do to accommodate moving into it his nursing home. I have no family left to help me. But first things first, I need to find a way to finance the skilled nursing facility – not a small worry either. Thus is right upon me, I have no where to turn. I must try to take care of one thing at a time. I am accustomed to taking life one day at time. Perhaps I can arrange to have my ashes spread in the ocean, my favorite place. I am not sure what I can depend in the funeral talked home to provide, I do have life insurance, which would finance this process, but I have A big fear of gong and arranging my funeral – and doing that alone too. I am lost. I know was provided to comment on LE, but they all tie in together. I certainly do not expect you to provide the answers to tie up the loose ends of my life. but I would like an opinion on how I have been treated. I have no transportation either, so getting to and from the nursing home to my doctors office is weighing on my mind. I can of afford a taxi service to get around. Then there is transportation everywhere else I need to go . I am terrified, as you can see, so much has to be done. It weighs heavily on me. My next thought is “It is Good that God does not provide me to pay to get to heaven. I suppose all of this will turn out the way it is supposed to, and I will do one day at a time to make sure these details ate prepared for. I have been a reader of yours for years now and trust your judgment. I am A “fellow “PINK RAH-RAH ‘NON-FAN. I used TO LOVE pink, and now it disgusts me, with the politics associated with it. I will put that aside, and talk about that in another post. Thank you for the information you have provided me over the years. You are such a good person, sweet and unselfish and have been a comfort to me for years. My best to you, and all your other readers. Please know I am not writing like this as a”pity party”. It is a comfort to know someone is aware of my situation. Fran, I am sorry about all of your issues and it’s horrible that all of your options weren’t made clear to you regarding reconstruction. I don’t really know the answers to your questions, but someone should be able to direct you. Your local clinic should certainly be able to help you connect with information and resources you need or want where you could get your questions answered. Thank you for your kind words about my blog. I wish you all the best too. Hope you find the resources and answers you need and deserve. I am not sure where you live. Do you have a Aging and Disability Resource Center accessible to you? They would be a great resource for you. I worked with elderly and persons on disability. If I can help you with anything, let me know. My name is Anne Monday and I am on Facebook. I am from Wisconsin. Well said. I got LT almost 20 years ago. It is no picnick. Thanks for continuing to bring up the subject. It is a devastating diagnosis. Helen, As always, your advice is spot-on. I know you speak from personal experience with lymphedema. Here’s the link to Helen’s blog everyone: https://lymphnodetransplant.wordpress.com/ She’s a wonderful advocate, so do check it out. Great article, Nancy! Every woman with breast cancer who has had lymph nodes removed, and especially who has had radiation therapy after the surgery, needs to be monitored for lymphedema and should know what symptoms to watch for. I feel fortunate I was part of a study utilizing bioimpedance, a test for lymphedema. Bioelectrical impedance (bioimpedance) measures the opposition of the flow of an electrical current through the body to show any buildup of lymphatic fluid in the affected extremity. Electrodes, like those used in an EKG, are attached to an arm and a leg to measure the lymph flow. Very simple, painless and non-invasive. Another non-invasive test is the perometry. I strongly feel women diagnosed with breast cancer should discuss their potential risk of lymphedema with their surgeon and their oncologist and be assertive in asking for information on this side effect. That discussion needs to include what testing will be done to detect lymphedema. And what about having a baseline test before surgery, as I did, and a follow up test at points post op to catch lymphedema early should it occur? Jan, Thank you for sharing about the bioimpedance test. I have never heard of this. It sounds very exciting, not to mention highly useful. You raise an important point – cost and disparity. Hate it when these things hinder getting proper healthcare. We do have a long way to go in correcting this problem. Thank you for sharing. Maybe someone else can get this test or at least look into it. But for sure, every bc patient should be able to ask for, and get, baseline measurements taken. Thanks again. Thank you for this information, Nancy. I have to admit I don’t think much about my lymphedema risks but I panicked when I was originally informed about this condition prior to surgery. I was told my risk was about 25% and that it could happen years later. I did not have the baseline limb measurements. I was not even aware of this until now. I too was asked not to carry heavy things with that arm (or have blood drawn from it) or take my blood pressure on that side. I spoiled that arm though. One thing I have noticed is that one side of my body is weaker than the other. I particularity notice it more when I stretch. Need to do more of that. I hope we don’t ever have to deal with this condition but it’s important to make people more aware of it. And I agree doctors should have more discussions with their patients about it. Rebecca, At least you were informed about LE. I must admit, I’ve become more lax as time has gone by and wonder if I should be doing more to reduce my risk. I wish there was more of a consensus on that. My left side is weaker too. But then I am right handed to begin with, so I’m not sure if it’s gotten weaker, but I suspect it probably has. Thank you for reading and sharing. I went for my first three month check today. I asked for advice about lymphodema from a patient navigator and had a baseline measurement taken. Thank goodness I asked! Reading your post gave me more information to ask more questions moving forward. Thank you. Pam, That is great you had baseline measurements taken! You are so smart to get that done. Thank you for sharing that. Its so confusing for breast cancer patients to know who to listen to. Every “expert” seems to have something different to say. The other complication is that we are all at different levels of age, weight, fitness, and health. What works for some may not work for others. My first experience with breast cancer was twenty years ago when I was a fit and healthy 45 year old. I read everything I could get my hands on about the disease, the surgery, and the possible side effects. My medical team only mentioned the condition when I brought it up and nobody did a baseline measurement on my arms or gave me any advice. Anything I learned about it, I learned on my own. I still remember feeling devastated when I read my first article on lymphodema. It cautioned readers not to lift anything heavy on their surgery side – not even a purse. When I told a friend how upset and worried I was, she said that her mom was in the first clinical trial that compared survivors who weight – trained with those that did not. Lo and behold the study showed no connection between exercise and lymphodema. So after surgery I slowly introduced exercise (including weights) into my daily routine with no ill effects. My second surgery was last year and this time the medical team did a baseline measurement between the arms and gave me some good information on lymphodema before I was released from the hospital. After my chemo was finished, the last thing my oncologist said to me was “exercise, exercise, exercise”. I’ve found that exercise seems to work for me though I acknowledge that there are no guarantees and I may develop lymphodema somewhere down the line. I’m attaching a link to a very good article on the subject in the hopes it might help some of your readers that just starting out on their cancer journey and are as scared as I was the first time I read about this horrible side effect. Knowledge is power! Thanks for this great forum. Helen, Movement is essential for so many reasons and you’re right, every person needs to work out what suits her/him best. As always, swimming is an excellent choice. Movement/exercise is so important when trying to lower risk or manage the condition once a person has it. Thanks for sharing. And again, thank you for all your advocacy work. Lennox, It is such a confusing topic, but this doesn’t mean LE risk shouldn’t be talked about. I agree, exercise is so important for so many reasons. Thank you for sharing about your experience and thanks for the link too. As others have noted, I too was told that with Sentinel Node removal there was no danger of LE; now I wonder, but practice diligent care to avoid it if possible. Is there any indication if surgery versus radiation causes it, or something else? Are surgeons so arrogant that they believe “their work” will not produce LE? Some ladies I’ve spoken with had LE emerge years after any surgery-radiation-chemo…what’s that about? I’m trying to arm myself (no pun intended) with as much information as possible to avoid LE, but crazy does live on my block some days! Does anyone else live with the fear of LE emergence? My surgeon didn’t talk about lymphedema at all. I didn’t even know to ask! He did say, no needles or blood pressure in my right arm, but he didn’t say why, and I was so overwhelmed by diagnosis and cancer, I didn’t even ask. So guess what happens when I’m wheeled from Recovery to my hospital room? A medical person (was too groggy to figure who it was) slaps a blood pressure cuff on my right arm and starts pumping. I raised a fuss and kept saying, “Not my right arm,” and she has the nerve to say, “What did you have done?” Then she looks at the chart and immediately does the BP on the left arm. Anyway, I learned what lymphedema was when within the first year after my axillary node dissection and radiation. I was opening doors with my right hand, and my hand and arm swelled up unbelievably! Then I had to have PT and that’s when I became educated, as I had to take a lymphedema class first. I wonder, why didn’t I have to attend the class before the surgery? I was going through the process blind. Thanks for a terrific post on an important topic. Beth, Sounds like your experience was similar to mine. No one ever mentioned the reason to me either for not doing the needles and blood pressure readings on my most-affected arm. It must have been frightening for you to experience that sudden flareup. Too bad there’s not better education all the way around regarding this important topic. Thank you for sharing about your experience. Hi everyone! 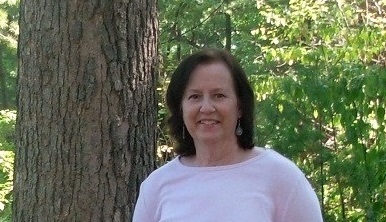 I am a 35 year break cancer survivor. I did not get lymphedema until two years ago when I was getting a massage and the therapist noticed how large my left arm was. My oncologist said I was the first patient in 28 years he has been in practice to have this so late. My point is that lymphedema is a life time risk after breast cancer surgery., I was diagnosed at a time when everything (34 nodes removed from right armpit and almost as many from the left arm pit). Just be vigilant at all times. Sondra, Thank you so much for sharing about your experience. You’re so right. LE can happen many years later. Being vigilant is important. As is information. Thank you for sharing. On additional comment for all. I do see a Lymphedema PT and, while the sessions are paid for by insurance, the supplies are not covered. The wraps and arm coverings are very costly. Sondra, Thank you for the additional comment. This is why the passage of the LE Treatment Act is so important.